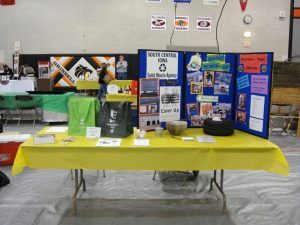 SCISWA also participates in community events like the Grinnell Home Show to further our community outreach. South Central Iowa Solid Waste Agency understands the importance of supporting environmental education both in and out of the classroom. Our goal is to educate the communities we serve about what they can do to protect the environment at all levels, from students to residents to civic groups. Last year, over 700 students and community members visited the SCISWA Education Center to learn about the environmental costs and challenges of solid waste management through tours and educational activities. Students can tour the landfill near Tracy and see for themselves the amount of garbage generated in our communities and learn about the steps taken to dispose of it properly. Appropriate for all ages. Approximately 1 hour. A tour of the Poweshiek Transfer Station near Malcom is an opportunity for students to see how garbage in Poweshiek County is collected, consolidated, and transported to the landfill in Tracy for final disposal. Appropriate for all ages. Approximately 1 hour. Build a model landfill cell inside a milk jug, fill it with “waste,” and cap the cell according to current regulations. This activity is designed to demonstrate construction of a modern landfill cell and how these engineering controls protect the environment. This activity is only offered on site at SCISWA Education Center and is not available in the classroom setting. Groundwater is a resource that we all depend on every day. Learn about aquifers, watersheds, groundwater well construction, and how SCISWA protects and monitors this essential resource throughout its landfill operations and activities. Students build model groundwater wells to explore the impact our communities make on our groundwater supply. Curious about the trash you send to the landfill? Bake a garbage pizza and learn about the types and amounts of materials sent to the SCISWA landfill in comparison to waste from the state of Iowa and across the nation. The non-edible model can be kept in your classroom. Little choices we make each day about how to get rid of things can add up to make a big difference. Learn about the types of materials you can recycle in your community with this hands-on sorting activity and get kids excited about recycling! Contact us to schedule a tour or activity, or make a day of it! See a sample itinerary for a full-day field trip for students. We are proud to partner with area recyclers to offer a comprehensive look at waste management in your community. See our School Field Trip Transportation Grant application.